BCHET member Larry Jeffers has taken on the role of managing the horseback trails located in and around Unaka Mountain. The trail manager interfaces with the US Forest Service Trail Technician in order to maintain or improve the exiting trails and to drive the development of new trails. It is also the responsibility of the trail manager to organize trail work days and to maintain a record of the time and equipment utilized to maintain or develop trails. Please report any concerns with the trail, (down trees, brush, washouts) to the trail manager. 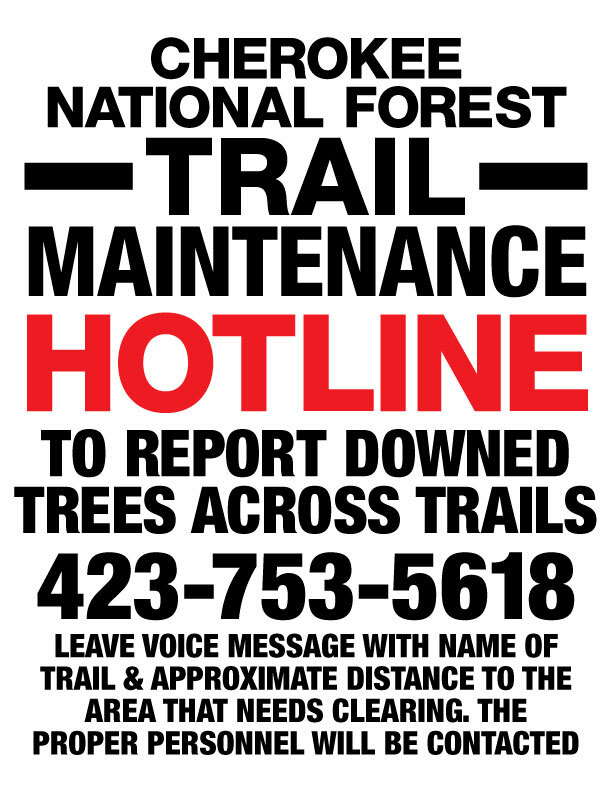 Please report any time that you spend conducting ANY trail maintenance to the to the trail manager listed below. It is very important that we record any time which a BCHET member spends preforming trail maintenance, no matter how minor. Directions : Travel East on I-26 to Exit 32. Take Exit 32 to the Stop Sign. Turn left at the Stop Sign. Travel a short distance to another Stop Sign and take a Right onto Highway 173. Travel 0.7 miles and then take a left onto Highway 107 (toward Grand View RV Park). Continue traveling on Highway 107, the total distance traveled on 107 is approximately 3.8 miles. There will be a Limestone Cove Picnic Area/Trail Head sign on the right side of the road. Just past this sign turn right onto Rocky Branch Rd. The parking area is immediately on the right. FOR SAFETY: When leaving please exit the parking area to the rear and turn right onto the loop road. This is a much safer exit point, as you can see traffic in both directions. There is also additional parking alongside the loop road. 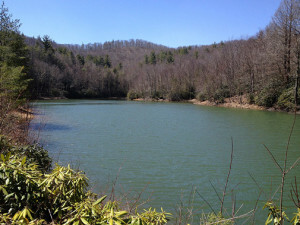 This trailhead provides access to two trail systems Dark Hollow and Limestone Cove. Description: To access the trails, ride your horse up Rocky Branch Rd. and around the Forestry Service gate. 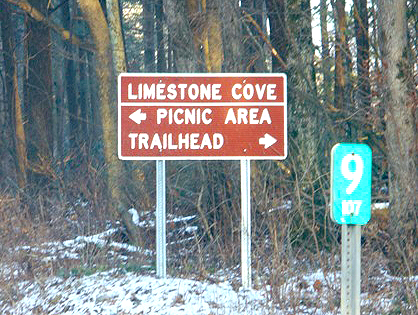 Continue to travel the forestry road and the Limestone Cove Trail is located less than a mile on the Right of the forest service road. You may continue on the forest service road which connects with Stamping Ground Ridge Trail which is located at the end of the forest service road. This trail system currently consists of two loops. Limestone Cove Trail was recently upgraded for horses and has been blazed in Yellow. The trail has steep riding in places and some loose rocky areas. The trail climbs for 3.5 miles before intersecting with Stamping Ground Ridge. 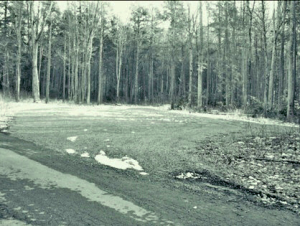 Turning Right on Stamping Ground Ridge will take you to the top and intersects with a gravel road (Unaka Mountain Rd). Turning right on the gravel road leads to the Unaka Mountain Overlook, Beauty Spot and beyond to Highway 395 (Rock Creek RD). Turning left leads back to 107. Turning Left on Stamping Ground Ridge provides a loop ride back to the beginning of Limestone Cove Trail. Stamping Ground Ridge Trail provides a gradual decline off the mountain. There are some narrow sections along the trail but for the most part this is good ride. There is an intersection about 3 miles down the trail, take a left at the intersection. This is the point where the connector trail begins. The BCHET volunteers completed this section Spring of 2011. Riding the loop in the opposite direction maybe preferred. This is the way many ride the loop. To ride in the opposite direction DO NOT turn onto the Limestone Cove Trail. Continue on the gravel road about two miles at which point the gravel ends and the connector to Stamping Ground Ridge begins. From this point follow the yellow blazes to the point where the Limestone Cove trail intersects with Stamping Ground Ridge. To access this loop, ride your horse up Rocky Branch Rd. and around the Forestry Service gate continue to travel the forestry road. Take the LCT trail which is located less than a mile on the Right of the forest service road. Follow the LCT for about a mile at which point you will need to turn RIGHT onto the LCT/Dicks Creek connector. Follow the trail which is marked with Yellow Blaze until the trail intersects with the Dicks Creek Trail. Turn Left on to the Dicks Creek Trail. To ride the Dark Hollow Loop, continue following the Dicks Creek Trail until the point where the loop begins. At this point you can either turn right and follow the yellow blaze or continue straight ahead on the Jeep trail. The Jeep trail will end at the Dark Hollow trail sign. At this point take a right and continue to follow the Yellow blaze. There is one spot on the trail, a large dirt area with a large mud hole on the right; it appears that three trails intersect here. You will need to continue straight ahead to follow the yellow blaze. This portion of the ride takes about 4 to 6 hours. Nice Ride! Travel East on I26 to Exit 32. Take Exit 32 to the Stop Sign. Turn left at the Stop Sign. Travel a short distance to another Stop Sign. Take a Right at the Stop Sign on to Highway 173. Travel roughly 5 miles miles and then take a left on to Highway 395 Rock Creek RD. Highway is steep in places. 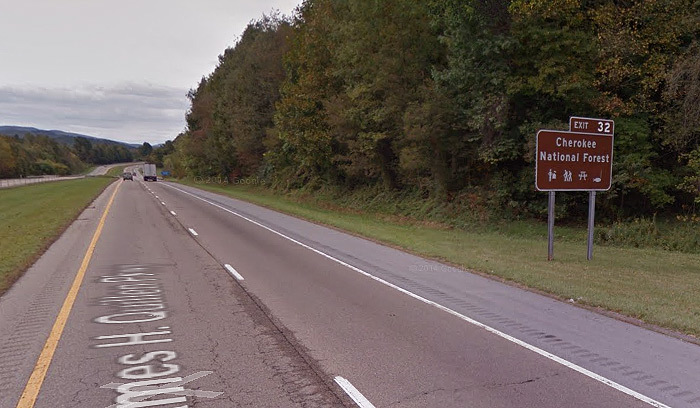 Travel approximately 6 miles to Tennessee / North Carolina Line. The parking area is on the left (very small 3 trailers). When lot is full some have used the edge of the highway on the NC side and the Unaka Mountain RD). To access Shinbone Trail (187) cross over Highway directly in front of the parking area and follow forest service road to gate. Continue around the gate continue approximately .5 miles trail 187 breaks to the left. This is a loop trail. Trail provides access to an overlook which the river and train rail can be viewed. Total distance from Long Arm Branch Trail Head to Hidden Lake and back is 16.0 Miles (7 – 8 hour ride). Very scenic trail with mountain streams, water falls , open hardwood forest, lake, wildflowers, wildlife & high elevation views of country. Trail is old road that 90% in very good shape…short section is steeper and rocky. Signage is poor…easy to get lost. GPS is recommended. We are working on making the .gpx file available for downloading for your GPS units. Refer to National Geographic Map 782 for directions to Long Arm Branch trail head. There is parking for a few horse trailers at the trail head. There is also one primitive campsite set up for horses just ahead of the trail head. Alternative ride is to Bear Wallow Gap and back. Total 8.0 miles.